10 Children's Movies Under $10! You are here: Home / Great Deals / Amazon Deals / 10 Children’s Movies Under $10! 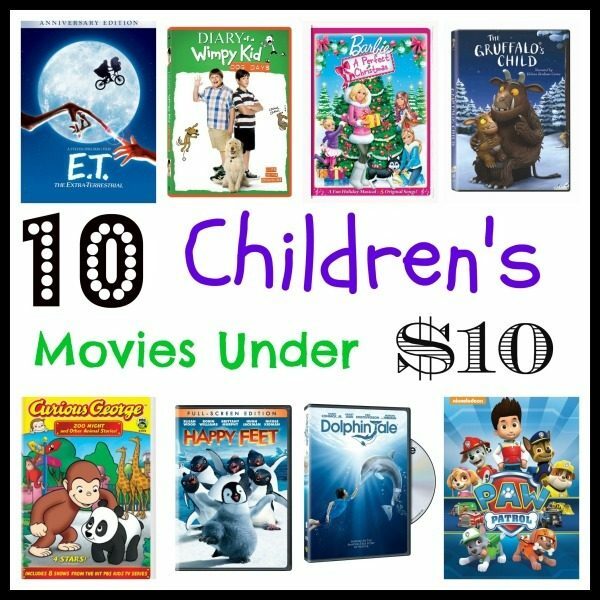 10 Children’s Movies Under $10! If you have kids, you’re probably always on the lookout for deals on children’s movies. Want some new titles for your home movie collection? Check out our list of 10 Children’s Movies Under $10! Curious George – Zoo Night & Other Animal Stories – $5 + FREE shipping! The Cat in the Hat Knows a Lot About That! Tricks and Treats – $5 + FREE shipping! Dolphin Tale – $5.87 + FREE shipping! Happy Feet – $5.97 + FREE shipping! E.T. The Extra-Terrestrial Anniversary Edition – $7.99 + FREE shipping! Gruffalo: The Gruffalo’s Child – $8.96 + FREE shipping! Barbie: A Perfect Christmas – $9.66 + FREE shipping! Looney Tunes: Premiere Collection, 28 Cartoon Classics – $9.86 + FREE shipping! Paw Patrol – $9.96 + FREE shipping! Diary of a Wimpy Kid: Dog Days – $9.99 + FREE shipping!